D.G. 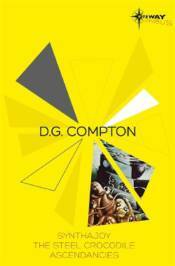 Compton is best known for his prescient 1974 novel, The Continuous Katherine Mortenhoe, which predicted the 21st century's obsessions with media voyeurism and 'reality television'. It was filmed as Death Watch in 1980 by Bertrand Tavernier. This omnibus collects three of his incisive SF novels, ASCENDANCIES, SYNTHAJOY and THE STEEL CROCODILE. SYNTHAJOY: Would you like to experience first-hand the emotions of a great artist, the sublime peace of a saint, the happiness of a child at Christmas? Try Sensitape. Or perhaps you had something more passionate in mind. Don't be shy. Ask for Sexitape. And for the true connoisseur, we have the ultimate human experience: a distinguished blend of synthetic ecstasies. The world is not ready for it, but perhaps you are. We call it Synthajoy. THE STEEL CROCODILE: In answer to an unanswerable future, science has created Bohn, the omnipotent computer whose flashing circuits and messianic pronouncements dictate what tomorrow will - or will not - be. But Matthew Oliver is flesh and blood and full of questions - not nearly as certain as the machine he's appointed to serve. And the right hand of science seldom knows what the left hand is doing.